6-week short term summer program. Earn up to 9 credits with courses that are pre-approved for your major, minor, certificate or school requirements. Fulfill an SAS 21st Century core requirement (1). Improve your Spanish proficiency by taking classes at the renowned Universidad de Salamanca. Travel throughout Spain to expand your knowledge of Spanish culture, history, and art. Application SIS19 will be open in December 2018. Successful completion of SPAN132: Intermediate Spanish prior to departing for the program. Students who have had previous experience or are Native Speakers, will need to take a placement exam and at least one semester of Spanish before studying abroad. Before traveling abroad, all Spanish majors and minors are required to meet with the undergraduate director for the pre-evaluation of courses. Non-Rutgers students and students who are not Spanish minors or majors will need to take a placement exam. Salamanca is home to Spain’s oldest unversity and also what is generally accepted as the country’s most beautiful Plaza Mayor. Located in the western part of the country near the border with Portugal, the city is known for its well-preserved historic center, its hearty castellano cooking (including wonderful cheeses and delicious Serrano ham), as well as for its sizeable student population. Not only does its university attract students from all over Spain, but also students from all over the world, who come to study Spanish language and culture there. 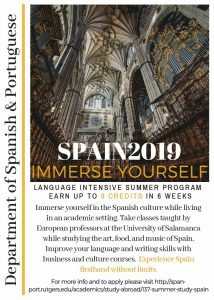 The Summer Study in Spain is ideal for students who wish to experience speaking Spanish while integrating in a culture known for its excellent food, art, Flamenco dance and bullfights. Travel to Madrid, Salamanca, Granada, Barcelona and other gorgeous cities while improving your linguistic skills. The Salamanca program offers a 5-week session through a wide selection of academic courses. Language instruction is in Spanish and designed for students at all levels. Students will be required to take a placement exam upon arrival at the University of Salamanca. All students must meet with the Undergraduate Director, Dr. Otero-Torres, to discuss course selection while abroad. For information regarding course eligibility please see Dr. Otero-Torres during her office hours or email her at dotero@spanport.rutgers.edu. There will be a week long excursion starting in Toledo and through Granada, Sevilla, and Ubeda. There will be weekend excursions to Madrid and Portugal, and a 3-day excursion to Barcelona. You will travel through Spain in private coach and stay at hotels provided by the travel agency. Breakfast is included, however lunch and dinner are not. Students will be given time to explore the cities on their own. Students will be housed in Aula Magna Residence in Salamanca. Students will reside (double occupancy) and dine at Aula Magna. While traveling through Spain students will stay at hotels provided by the travel agency. All 3 meals (breakfast,lunch and dinner) will be provided by Aula Magna residency. For weekend and 3-day excursions, students will be responsible for lunch and dinner. Hotels will provide breakfast. Financial aid is available for Study Abroad programs. For more information on how to apply for financial aid, please visit the Office of Financial Aid website at: https://studentaid.rutgers.edu/abroad.aspx. Summer Financial Aid is available, but funding is limited. Summer aid online applications will be available at the beginning of April 2019. For Study Abroad Scholarships, please click here. Raritan River Review: Read the article about Study Abroad in Peru. Admission is on a rolling basis, Applications will be immediately notified of acceptance into this program and will be able to complete post-decision materials prior to the term’s application deadline. Application deadline for 2017: March 1, 2017. Summer Study in Cusco, Peru: Spanish language and culture, community service, and indigenous cultures. Have you completed at least a year of college Spanish? 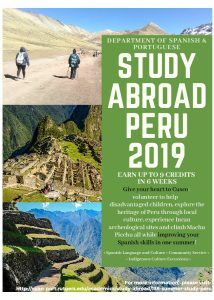 Apply for Rutgers Summer Study Abroad in Peru, and earn 9 Rutgers credits, or half of a Spanish minor. Courses on Quechua language are available, too. Students may apply their financial aid to the cost of the program. Intermediate Spanish I and II, Spanish Culture I and II, Conversation and Composition, Introduction to Hispanic Literature, Introduction to the Study of Language, Advanced Grammar and Composition, Intro. to Translation Studies, Literature and Culture of Spanish America, Civilization of Spanish America, Topics in Hispanics Linguistics, Topics in Hispanic Literature and Culture. The two-credit Independent Study results in a research project related to the Peruvian experience. Serve the Cusco community working with disadvantaged children. Pre-med, nursing and pharmacy students may work in a local hospital. Complete a one-credit Service Learning Internship by volunteering 10 hours a week (40 hours total) at the local hospital for children with disabilities, a nearby orphanage, or in the hospital. Support the staff with the daily care of the children or by assisting with important auxiliary activities. Get the information about Study Abroad credit transfer, registration, and transcripts. Visit the Inca archeological sites around Cuzco, romp with the masked dancers of Paucartambo, climb Macchu Pichu, navigate the waters of Lake Titicaca, spend a night with villagers on an island and taste the amazing flavors of Peruvian cuisine. While in Cusco you will be accommodated during the first week at a comfortable and conveniently located hostel. The hostel is located a five-minute taxi ride from the language school and the ancient Plaza de Armas, center of the Inca Empire. During the last three weeks in Cusco students will live with selected local families, the perfect opportunity to practice Spanish and have an in-depth experience with local culture. Students will be paired and share a room. Program cost includes tuition, excursions, housing, most meals, HTH Health Insurance and program administration. Students are also encouraged to start researching Scholarship opportunities as early as possible. Page last updated by World Languages and Cultures at 11:26 am October 5, 2018 . This page was printed from http://foreignlanguages.camden.rutgers.edu/spanish/spanish-study-abroad/ at 12:28 AM Monday, April 22, 2019.